A UK based company Oxitec has earlier approached the Indian authorities seeking permission to conduct trails of genetically modified mosquito claiming that it would fight the dengue menace. The modified male mosquito named ‘513A’ will have a gene that ensures its offspring dies before reaching adulthood (in 2-5 days) and thus would control breeding of dengue spreading mosquitoes. The UK- based Oxitec develops technologies for controlling insects were here to seek approvals to begin their trails for GM mosquitoes. This GM- mosquito was earlier tested in Brazil, where dengue was a big worry during the recently concluded World Cup Football tournament, and the Cayman Islands. Oxitec is currently working with GBIT, a privately held Indian company that specializes in developing and commercializing novel technologies in health and agriculture, with a view to introduce this technology for dengue vector control in India. In the laboratory, the activity of this gene can be controlled by giving mosquitoes the antidote ‘tetracycline’. They would also like to use the same approach for the vectors of malaria but this work is still in its bud stage. 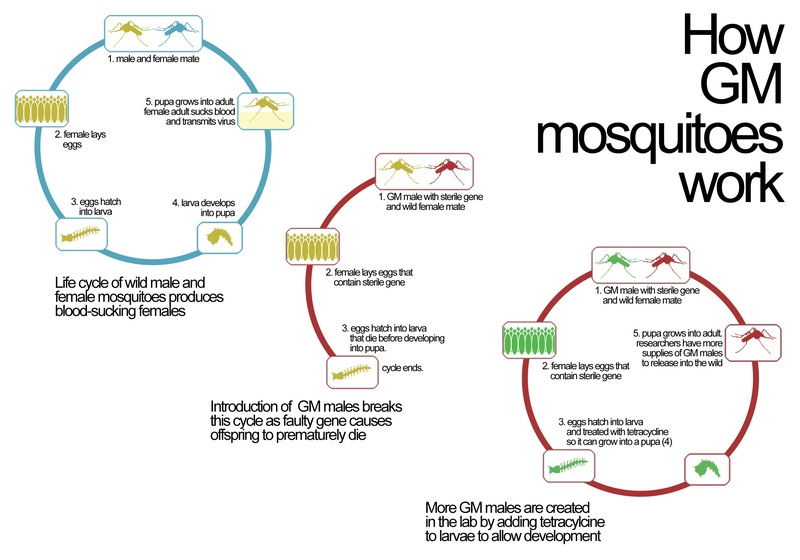 These GM male mosquitoes can mate only with females of the same species (dengue spreading), so that it is exclusively targeted to the dengue mosquito with no effect on other insect species. Every wild female which mates one of our modified males will have offspring who carry the gene and without the antidote, they won’t survive. In this way, by repeatedly releasing Oxitec males, we can drastically reduce or even locally eliminate the dengue mosquito population. GBIT has already received nod for contained laboratory-based studies. Besides, permission for larger technology trials has been sought from the Review Committee for Genetic Manipulation (RCGM). Field based studies would only begin following appraisal and approval by the relevant national bio safety committees, RCGM and Genetic Engineering Approval Committee (GEAC). RCGM and GEAC come under the Ministry of Environment and Forests.